“How much farther up does this go?”….. Up being the key word as we had climbed for half an hour and still were climbing. I knew we were on the right trail, but I couldn’t see where it ultimately went. The thick Carolina forest was only revealing it’s secrets in small portions today. I had heard this trail was one of the tougher hikes on the hiking challenge and so far it was living up to its description. 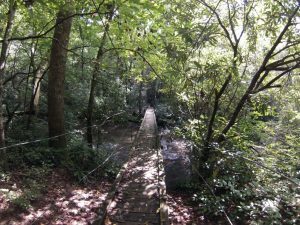 We were taking on the Turkeypen hiking trail near Ashville, North Carolina and it is one of eight hikes listed on the Carolina Mountain Land Conservancy’s hiking challenge 2.0. When you complete all eight hikes, you’ll receive a White Squirrel patch. I’ve yet to see a real live white squirrel although everyone swears they exist. White Squirrel or not, the hiking challenge is a great way to encourage people to get out and explore new scenery. Turkey Pen/South Mills River gap would be my 4th hike in the series, and it’s rated very strenuous at 6.4 miles and elevation gain of 1,240 feet. 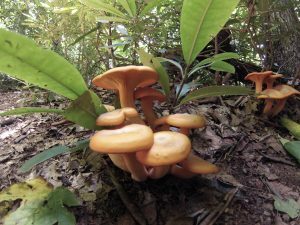 We continued the steep ascent stopping along the way to photograph the tall trees and tons of mushrooms. I’ve never seen so many different mushrooms on one trail. I enjoy fried mushrooms, but I have no idea which ones to pick so I just took photos. Finally, we reached the top of the trail and were greeted with a survey marker noting the trail and elevation. The top was shrouded in thick foliage which was nice for the shade, but the expansive views were hidden. Take this hike in the fall and I bet you’d see great views. Happy to have the hardest part of the trail behind us we descended into a lush forest with babbling brooks and moss covered logs. The guide labeled this section the Garden of Eden and it was easy to see why. Even the Garden of Eden had its surprises and this trail had one more challenge for us. Backtracking a bit didn’t reveal any missed turnoffs and so this has to be the way to go. I decided to go scope it out and return with a report. I picked my way over the rocks and headed down the stream. After a little ways, I found the only exit point which was through tall brush that appeared to have remnants of path through it. Although it appeared to not have been used in eons. There were two options here; snakes or poison ivy. I’d prefer the snakes because generally they move, although in a similar area, I saw a rattlesnake hold its ground. Yeah I moved that time! Trekking poles in hand, I plowed through the dense foliage. Shortly after that adventure, the trail again dead ended in a large creek. However this was noted on the trail guide and there is a trail that goes to a fun swinging bridge. The swinging bridge wasn’t too high over the water and was easy to make swing. I bounced, rocked my way over the bridge and just had fun playing. Don’t ask me why I found that so entertaining, but at one point I almost went right into the creek. Leaving the bridge, the easy trail follows the creek with access points among the trees. One stop was too inviting to miss and we stretched out on a rock in the warm sun. 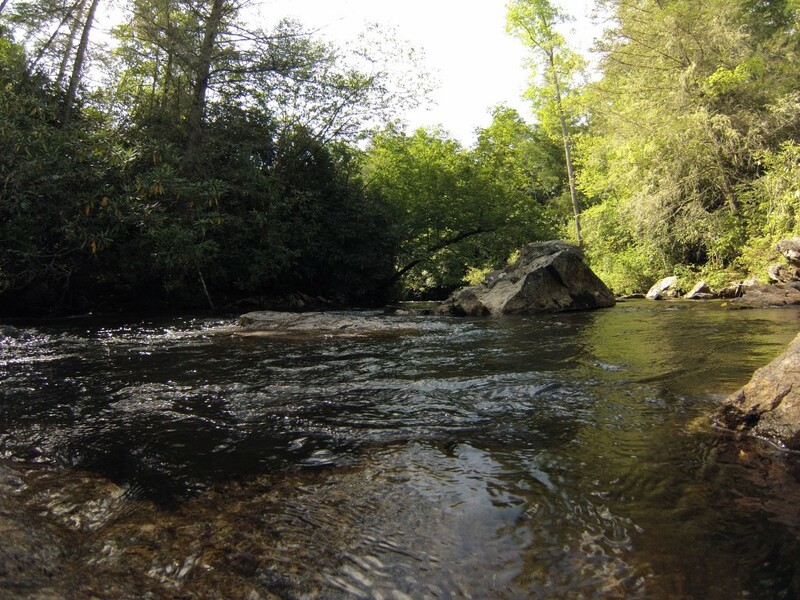 The sound of the water, the warm sun, and warm rocks and I could’ve easily taken a long nap. That or it was the fact we’d been walking for hours. Days it seemed. The trail crosses more bridges, then makes another small ascent and ends up in the far end of the parking lot behind the sign with the big map. 5 hours and 6.4 miles later, we were done and mostly spent. It turned out to be a combination of hike and adventure, which always makes for memorable trips. As I took one last, long look at that creek babbling among the green trees, I can only imagine how beautiful it is in the fall. I already see a return visit in my future. You’ve been to God’s country, friend. That part of the state is incredible, and you’re right, even more so in autumn. Definitely worth a return visit!